Room Spray made from Cyclomethicone is simply the best. This clear liquid is a silicone with absolutely no odor, unlike alcohol based room sprays! It mixes with FOs or EOs beautifully with no clouding, or separation! 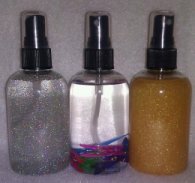 Small bottles with fine mist sprayers are recommended (this product goes a long way and a small bottle will last awhile!) This stuff is truly amazing, once you try it you'll be hooked!